The second law of thermodynamics revolves around entropy, the principle that things move to disorder and chaos over time. Left alone, things do not become more orderly or more effective. Your once well-ordered garage digresses to clutter. No matter how much you attempt to wish it into existence, your garage will not get more clean and organized without your intervention. 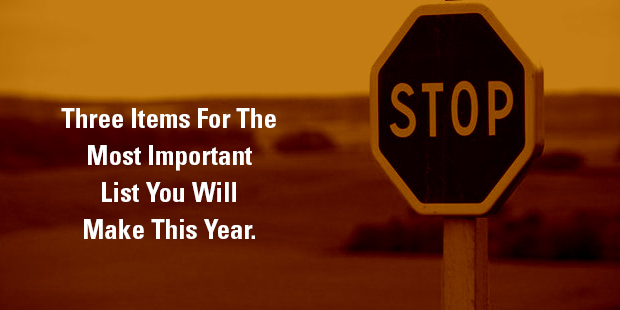 In the same way, our calendars and organizations become more cluttered without intervention. Organizational entropy is currently happening unless you are actively fighting against it. For this reason, leaders are often encouraged to develop “stop doing” lists so they may transfer time and energy and resources to what is more important. Without a “stop doing” list, unnecessary tasks will remain on job profiles and unfruitful meetings will remain on calendars. An unnecessary task is something no one should be doing. Not anymore. Think of scaffolding that is used to build a building. The scaffolding, though extremely important at one point in time, does not always remain. Sadly, some unnecessary work and systems can remain if leaders don’t regularly remove the unnecessary. Peter Drucker said, “There is nothing so useless as doing efficiently that which should not be done at all.” When you eliminate unnecessary work, you are able to reallocate energy and resources to what is most important. A redundant task is a task someone else is already doing. There are necessary tasks that are often redundant, meaning, someone else is already handling them. Instead of two people doing the same thing, two people can focus on two different important actions and add more value to the mission of the team. Because of entropy, a “stop doing” list is not a one-time exercise. > Read more from Eric.